Fairlawn Brought Me Back - 28 years & thousands of comeback stories. Tell Us Yours! Fairlawn Rehabilitation Hospital has helped thousands of people move forward with their lives. 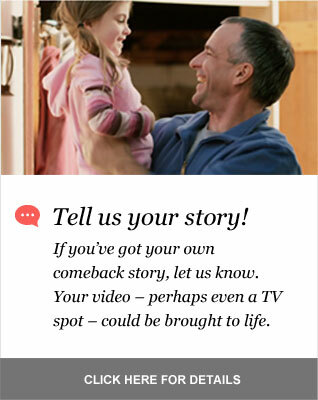 Here’s your chance to bring your own story to life. Anyone who has battled their way back from injury, illness and disability knows the personal and physical strength it takes to succeed. Each year in our region, thousands of people work their way back from debilitating challenges. At Fairlawn, we’ve helped a lot of them. Our acute rehabilitation hospital, the only one in Central Massachusetts, has the physicians, nurses and therapists capable of helping people with the most serious medical challenges. With inpatient and outpatient services, our patients’ success stories inspire and ultimately give us a glimpse of what’s possible when great care and great spirit come together.